Conflict is part and partial to the human condition, so it’s natural to crop up at work with some frequency. If you’ve had the fortune to work on a stellar team, chances are you’ve seen how healthy, productive conflict can drive a team or organization to unexpected places. But often, conflict is just that. A feeling of frustration emerges between two individuals, lines are drawn, and we forget that we’re on the same team. While I’d seen conflict on both ends of this spectrum, it wasn’t until I listened to an episode of the HBR Ideacast that I had a better sense of the nuance that causes conflict to morph and escalate depending on the situation. 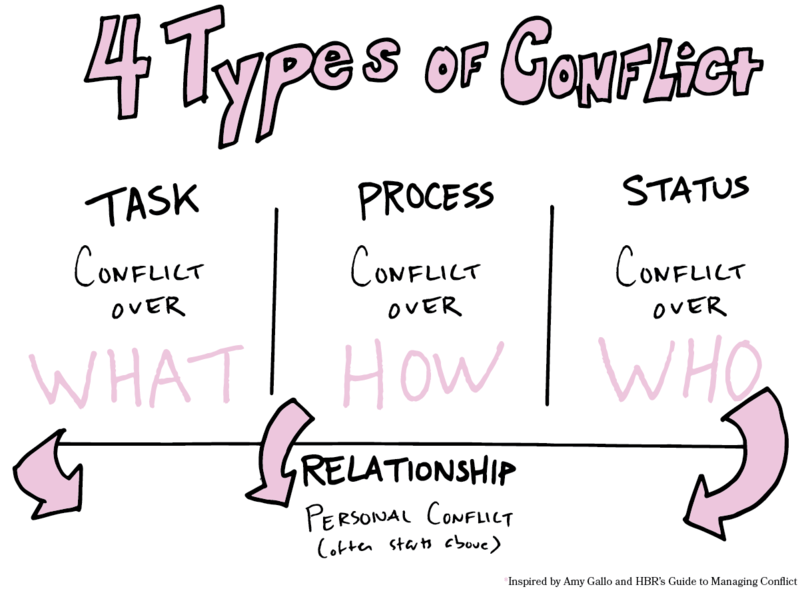 In “4 Types of Conflict and How to Manage Them,” Amy Gallo shares the highlights of her HBR Guide to Managing Conflict at Work. And like the title suggests, she notes four types of conflict: relationship, task, process, and status. I once found conflict of this type to often be inexplicable. Suddenly a colleague and I just didn’t like each other. However, as Gallo explains, relationship conflict often starts somewhere else and only becomes personal when previous disagreements are left unresolved. 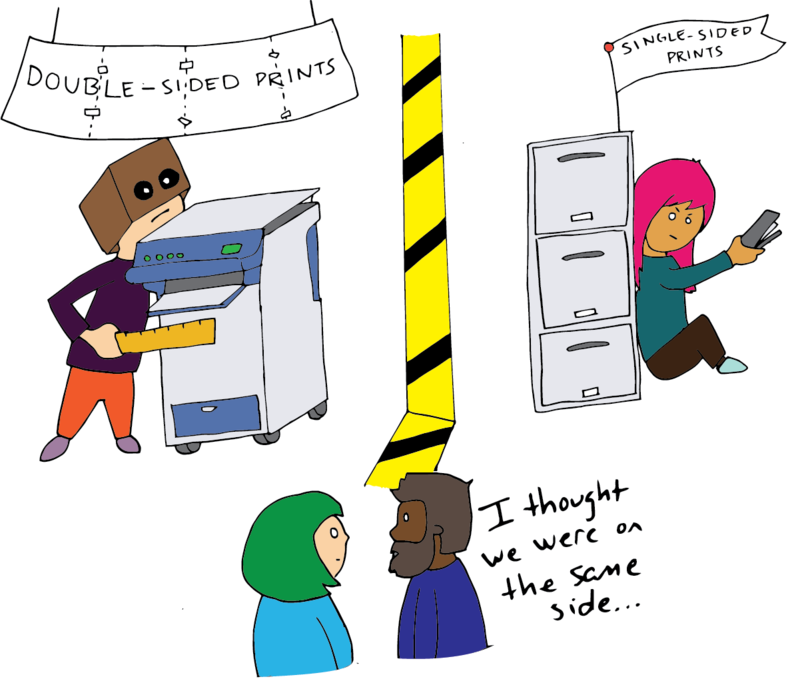 Task conflict is a disagreement over the goal or objective of something, be it a project, a discussion, meeting, etc. At the organizational level, this might manifest in two departments wanting different things from a client situation. At the team level, this could be a lack of alignment on a project’s desired outcome. As a manager, I’ve found it helpful to always circle back to the objective, to clarify and realign, to avoid task conflict from creeping in. Whereas task conflict concerns the goal of a project, process conflict is a disagreement over how to get there. I’m a firm believer that there’s almost never a single, perfect way to approach something, but rather multiple good approaches, all with merits and drawbacks. To avoid process conflict from evolving into relationship conflict, I’ve found it’s helpful to create forums where a team can debate the steps they hope to take, versus creating the steps for them. Finally, status conflict manifests when there’s confusion or a disagreement over who is in charge. This is common in interdepartmental initiatives, but I find it crops up on our teams when we have reports collaborating on a project. In such cases, I find it can be helpful to divest decision making authority by making it clear who gets to make the call. By putting conflict into these terms, I’ve found it much easier to dive into a disagreement by first deciding what’s at the core of the conflict. And by sharing this with team members, it gives them a language to work through the conflict themselves. Here’s a cheat sheet that sums the framework up.